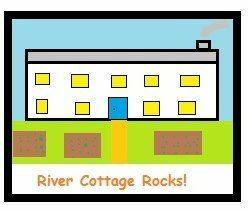 There's a new cooking challenge - it's called River Cottage Rocks and it's run by Jo at Jo's Kitchen (The Hungry Blogger). I don't own a single book by Hugh Fearnly-Whittingstall although I have my eye on the Vegetarian one from his last series. However, there are recipes a plenty on the Guardian website so that did not deter me. I liked the look of this Jerk Chicken with Rice and Peas and, strangely, I have never made Jerk chicken, so it was something that I wanted to try. I used skinned chicken breasts as that was what I had in the freezer and I have to say that they were absolutely delicious, not dry at all and there was just the right amount of heat in the paste. I didn't leave it overnight, but put the paste on in the morning and left it for around 5 hours before cooking. The rice and peas I'm not so sure of, I think I would like to check out some other recipes for this as I was slightly disappointed in the lack of flavour. The closing date for this challenge is 12th February, so you need to get your skates on if you are going to take part! Looks delicious!! I love jerk chicken. Sounds like a great challenge too. 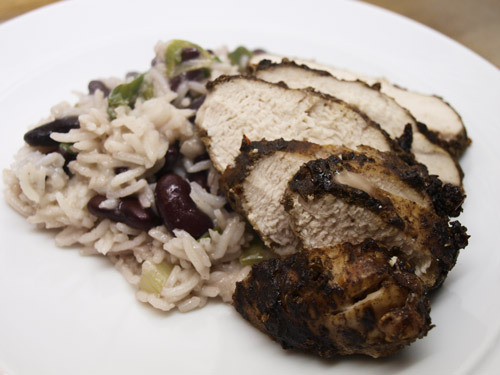 I haven't made jerk chicken before either but I love the look of the coating on that chicken! Forget Love - I'd rather fall in chocolate! More 'Bilbao' than Boston Baked Beans!